With Octave One’s latest album, ‘Burn It Down’, apparently still making an impact on dancefloors worldwide, the time has come for a top team of remixers to add their own spin on one of the tracks from it. The track is ‘Jazzo/Lose Myself’ and the remixers are Paul Woolford and Mat Playford, with new dubs and instrumental mixes also included on the package. 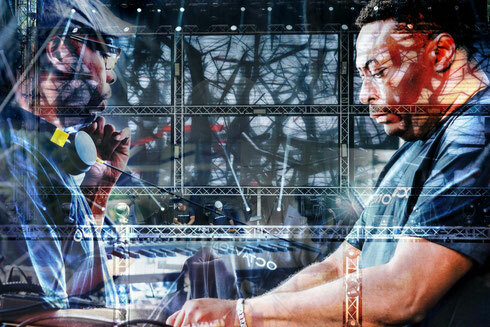 Detroit’s Burden brothers Octave One are possibly known around their world for their live sets. That latest album was another broad proposition full of many analogue house and techno styles. The track that gets remixed here actually features vocals from Ann Sanderson, who also sung on Octave One’s hit, ‘Blackwater’. Paul Woolford is first to go and is someone who has been turning out left of centre house and techno cuts on labels like Hotflush, Cocoon and Planet E For years. The Leeds based producer has a real understanding of his studio gear, which was never more evident than on this remix, as Paul has said before that Octave One have been a huge influence on him. Next up is Mat Playford, someone who has being doing his own thing for over ten years on labels like Intimacy, Skint and his own Social Problem. As well as this he is a resident DJ and remixer for the Hard Times crew and is a regard at places like We Love… in Ibiza. His rework is deep and melodic, with fat synth lines and smeared chords all adding up to a colourful and intense techno remix, complete with strings. As well as the original and an InstruDub from the 2014 vinyl release, this new digital package also includes the Ocapella version for DJs to use at their leisure. It’s out 4 December on 430 West.